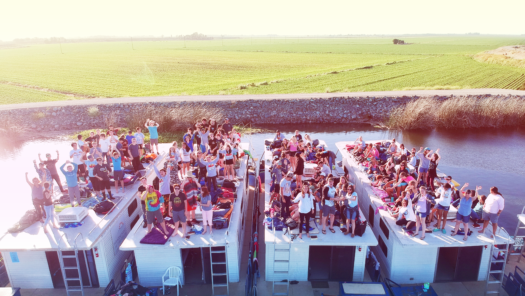 Summer camp for High School students is a combination of high energy water sports and low key times of connection. We’ll head up to the Sacramento Delta and make our home on a houseboat for the week. We’ll wake up to beautiful sunrises and sleep under the stars on the top of our boats. Days will be spent wake boarding, knee boarding, banana boating, swimming, fishing, playing games and hanging out with friends. We’ll also worship and spend time growing in our faith early in the morning and as the sun sets on the Delta. Students going into 9th grade (Fall of 2019) and current high school seniors. We start and end our trip at Paradise Point in Stockton, CA. We travel a few times on the channels of the Sacramento Delta and mid-week we make a stop for a night of worship, testimonies, skits and response and a morning for quiet time with God. Hmm…this one’s easy! Simply, it’ll be the best week of your summer! Wake boarding. Knee boarding. Swimming. Fishing. Playing cards. Making bracelets. Dance parties. Cooking together. Worship at sunset. Time with friends. Time with God. Skits. Testimonies. Small group. Shooting stars. Beautiful sunrises. Boondoggle. Olympics. and more! How much is it to go on Houseboats? The total cost is $375 but we break down the cost into 4 manageable payments. Payments cannot be transferred to siblings and/or friends within 2 months of the trip. No payments may be transferred to another church event at any time. Therefore, we encourage all parents and students to plan ahead before sending a deposit and/or payment and financially committing to attend a HSM trip.